Our organization provides a wide range of Club Leg Guards to our clients at industry leading prices. These are available in various specifications and extensively used in both one day and test series .We also provides customized solution to our clients as per their requirement. They are used in order to prevent the player from getting injured. We offer a wide range of Cricket Batting Leg Guard (Size: Men/Youth/Boys) and Cricket Wicket Keeping Leg Guard (Size: Men/Youth/Boys) that are widely acclaimed for their durability and reliability. These are manufactured under strict quality controls that ensure optimum quality to our clients. We take pride in offering a comprehensive range of Batting Leg Guard Run Maker , that are very easy to use and install. Our range is ideal to be used in light, medium and heavy traffic areas. We also offer these in variety of sizes as per the requirements of our clients. Our products have unique properties to resist weather. Keeping in mind the ever-evolving needs of our clients, we are devoted towards offering an optimum quality array of Leg Guard. Color: Colour And Design will be dispatch as per availability. The company is the leading exporter and supplier of cricket leg pads in meerut. 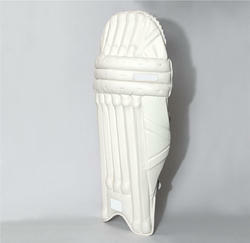 The company is offering a wide range of the cricket leg pads and easily caters to the bulk orders as well.